Copyright: © 2018 Foutami IJ, et al. This is an open-access article distributed under the terms of the Creative Commons Attribution License, which permits unrestricted use, distribution, and reproduction in any medium, provided the original author and source are credited. The purpose of this study was an investigation of phytochemical and antioxidant characteristics in aerial parts of Salvia multicaulis Vahl and Salvia Sclarea L. and the effect of ecological factors on their distribution in Behshahr Hezarjarib area. Salvia grows wildly in the north of Iran. Literature review has shown that there is no report on phytochemical investigation about aerial parts of Salvia in north of Iran. In order to understand the relationship between vegetation and environmental factors, the PCA (Principle Component Analysis) method has been adopted. Essential oil of the aerial part of Salvia was analyzed by GC/MS. Antioxidant activities were evaluated by DPPH test. Thirteen and five components were identified representing 94.01% and 99.9% of the oils, respectively. The main compounds of Salvia multicaulis Vahl were α-Pinene (29.82), 1,8-Cineole (23.84) and Camphor (19.93) while 1,6-Cyclodecadiene (41.95) and β-Caryophyllene (36.19) were the major ingredients of Salvia Sclarea L.
Salvia species are important because of their multiple uses like: anti-bacterial, anti-virus, anti-oxidant, anti-malarial, antiinflammatory, anti-diabetic, cardiovascular, anti-tumor and anti-cancer. Each species contains lots of flavonoids and tannin (Caffeic acid, chlorogenic acid, gallic acid) . Aerial parts of S. sclarea L. are recommended as energy providers and the antiseizure. Their flowering branches are used as aromatic and Sweetener. Essential oils of clary sage are used in making Perfume and cologne . Most components of essential oils of S. sclarea L. are Linalyl acetate, Linalool, α-Terpineol, Dgermacrene, β-caryophyllene, B-cyclo germacrene, Sclareol, Geranyl [3,4]. S. sclarea, S. multicaulis and S. verticillata have moderate-to-high antimicrobial effects . Song et al. analyzed grassland plant communities in the Baloung Mountain . They adopted TWINSPAN and DCA for classification and ordination. Munhoz et al. investigated the association between plant species and environmental factors in humid savannah, central area of Brazil. The Significant correlation was found by CCA between soil texture and moisture with the distribution of plant species. Yibing applied CA and PCA in China and found that soil physical and chemical properties like nutrients, moisture, salinity and pH affected on homogeneous habitat, controlled distribution of plant communities in these areas . Mills et al. conducted a study in the semi-arid regions Caro in South Africa to evaluate the permeability of the soil as an influential factor in diversity and richness of vegetation in these areas . Regression results data proved that the highest species richness was found in places that permeability and pH were low, and the soil has high nitrogen content. The study in the forests of southwest China indicated that topographic factors: elevation, slope and the protrusions rocks, and soil parameters like total phosphorous, potassium and exchangeable calcium affect the distribution of plant communities . Vogiatzakis et al. evaluated the macrophyte community structure and the presence of species in relation to environmental constraints in Greece and concluded that the most substantial environmental factor on this situation is Water storage in the soil and water holding capacity . In the present study, we investigated the phytochemical, antioxidant characteristics and the amount of flavonoids and phenolic compounds in aerial parts of Salvia multicaulis Vahl and Salvia Sclarea L. and the effect of ecological factors on their distribution in Behshahr Hezarjarib area. The aerial parts of Salvia multicaulis Vahl and Salvia Sclarea L. were collected at full flowering stage in May 2017 from Hezar Jerib area, Mazandaran province, north of Iran. The Study area is located in the north of Iran and is part of the Hezar Jerib highland. Longitude is 54°03’48“ to 53°58’16“ east and Latitude is 36°34’22“ to 36°24’18“ north. Its altitudinal range is between 1600 to 2800 meters above sea level. The airdried and powdered plant samples (10 g) were extracted for 48 h using 200 mL n-hexane, ethyl acetate and methanol, successively by maceration on a shaker at room temperature. The extracts were filtered and concentrated by a rotary evaporator at 40°C. The filtered extracts were stored at -20°C until the experiment. Essential oils were obtained from airdried and comminuted aerial parts and roots (100 g each) by hydro-distillation using a Clevenger-type apparatus for 4 h.
The essential oil of Salvia specimens was analyzed by GC-MS using an Agilent 7890 A. Film thickness of 0.25 μm, a length of 30 m, and an internal diameter of 0.25 mm. The carrier gas was helium. Inlet temperature was 230°C and injector temperature was 280°C . The total phenolic contents of the plant extracts were estimated by using Folin-Ciocalteu assay . 2.5 mL of samples were mixed with 2.5 mL of Folin-Ciocalteu reagent. Then 50 μL of sodium carbonate (7%) was added to the mixtures and the volume was adjusted to 250 mL by adding distilled water. The mixtures were mixed thoroughly for 30 min at room temperature in the dark. Absorbance of the sample solutions against a blank was determined at 765 nm using a micro plate reader. Total phenolic contents were expressed as mg of gallic acid equivalents per gram of dry extract (mg GAE/g of extract). Different concentrations of gallic acid as standard (12.5, 25, 50, 100, 200 μg/mL) were used to construct a calibration curve. All measurements were carried out in triplicate . The total flavonoid content of the extracts was estimated according to a previously described method . The absorbance was measured against a blank at 510 nm. Results were expressed as mg of quercetin equivalents per gram of dried extract. Different concentrations of quercetin as standard (12.5, 25, 50, 100, 200 μg/mL) were used to construct a calibration curve. All measurements were carried out in triplicate . While absorbing from the mixture in the presence of the samples, Ab is absorbing of blank and Ac is absorbing of control. A lower absorbance of the mixture indicated a higher DPPH radical scavenging potential. IC50 value (μg extract/mL) was the concentration at which 50% of DPPH radicals, is inhibited and obtained by interpolation from linear regression calculation . For each species, 5 soil samples were collected, Soil samples were taken from depths of 0 to 30 cm. Soil texture was determined by the hydrometer methods. Soil acidity in the saturation paste was determined by using a pH meter. EC was determined by the electrical conductivity meter . Soil organic carbon was measured by titration . The lime was obtained from the reaction of hydrochloric acid normal with soil calcium carbonate profit by titration. Bulk density was measured by paraffin method . Soil moisture was measured by weight methods . Potassium and sodium were determined by a flame photometer and calcium and magnesium were determined by titration method . Classification of vegetation has different methods that in this study were adopted the conventional method called hierarchical cumulative (cluster analysis). SPSS 19 software was adopted and Edwards’s method was adopted to calculate the distance between the clusters in the cluster analysis. The Euclidean index was considered as distance index. The output of this analysis was interpreted as a dendrogram. PCA analysis was adopted to analyze the relationship between species and samples in two space dimensions. Results showed that Salvia Sclarea L. grow in 1620 m height, in 75 km distance from Behshahr City and in its habitat average annual rainfall is 363.93 mm, average annual temperature is 10.16°C and soil properties like: Organic matter, CaCO3, pH and EC are 5.78, 29.43, 7.48 and 0.60, respectively (Table 1). Results showed that Salvia multicaulis Vahl grow in Hezar Jerib summer rangeland, in 2260 m height, in 150 km distance from Behshahr City, and in its habitat average annual rainfall is 184.65 mm, average annual temperature is 7.213°C and soil properties like: Organic matter, CaCO3, pH and EC are 3.61, 37.23, 7.64 and 0.60, respectively (Table 1). 46 species belong to 42 Genus and 16 families were identified in the habitats of Salvia Sclarea. Gramineae family has more species and also Hemicryptophyes is the most frequent (Table 2). Table 2: Associated species of Salvia sclarea L., as well as life forms, growth forms. Geophytes: Ge, Phanerophytes: Ph, Chameophytes: Ch, Throphytes: Te, Hemicryptophytes: He, annual: A, perennial: P.
Hemicryptophytes with 71.73% abundance has been recognized as the dominant growth forms. Geophytes with 2.17%, Phanerophytes with 2.17%, Throphytes with 13.4% and Chameophytes with 10.86% are other forms (Figure 1). Figure 1: The frequency of species according to growth forms. Perennial plants are the dominant life forms with 76.08%. Another species are annual with 23.92% (Figure 2). 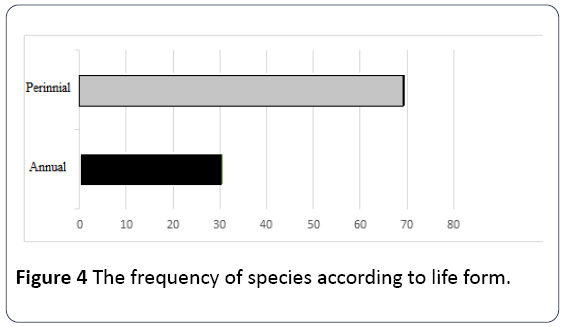 Figure 2: The frequency of species according to life forms. 36 species belong to 27 Genus and 15 families were identified in the habitats of Salvia multicaulis Vahl. Leguminoseae family has more species and also Hemicryptophyes is the most frequent (Table 3). Table 3: Associated species of Salvia multicaulis Vahl, as well as life forms, growth forms. Geophytes: Ge, Phanerophytes: Ph, Chameophytes: Ch, Throphytes: Te, Hemicryptophytes: He, annual: A, perennial: P.
Hemicryptophytes with 58.33% abundance has been recognized as the dominant growth forms. 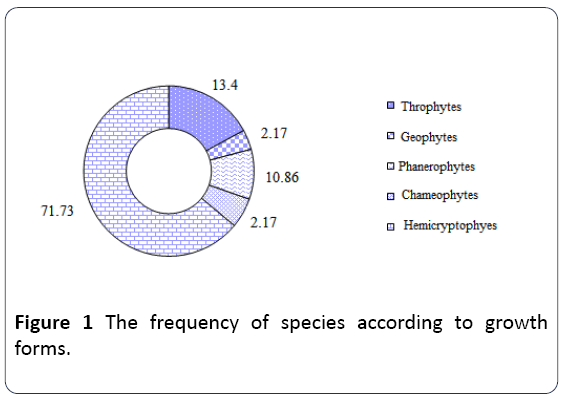 Geophytes with 5.5%, Phanerophytes with 8.33%, Throphytes with 22.22% and Chameophytes with 5.5% are other forms (Figure 3). Figure 3: The frequency of specimens according to growth forms. Perennial plants are the dominant life forms with 69.44%. Other specimens are annual with 30.55% (Figure 4). 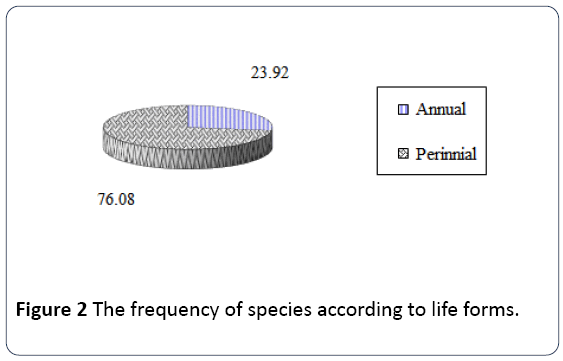 Figure 4: The frequency of species according to life form. The chemical composition of S. sclarea L. essential oil is summarized in Table 4. A total of 5 compounds were identified representing 99.9% of the total composition. The essential oil was dominated by 1,6-Cyclodecadiene (41.95%) and β- Caryophyllene (36.10%) (Table 4). SokoviÃÂ done a research on the chemical composition of wild S. sclarea L. in Serbia and shown that main component is the diterpene sclareol (28.29%) . Pitarokili et al. recognized 66 compounds and linalyl acetate, linalool, geranyl acetate, and terpineol were the main components . The results of Fraternale et al. shown that linalool, linalyl acetate, geranyl acetate, trans-β-ocimene, and caryophyllene oxide were the dominant components . Dzamic et al. concluded that the main components of Salvia Sclarea L. were linalyl acetate (52.83%), linalool (18.18%), α- terpineol (5%), α-pinene (4.57%), 1.8-cineole (2.29%), limonene (1.55%), β-caryophyllene (1.83%) and β-terpineol (1.19%) and identified 34 components . Ghani et al. reported that the major constituents of the essential oil of (Salvia Sclarea L.) cultivated in Mashhad climatic conditions were linalool (30.03%), linalyl acetate (23.08%) and α-terpineol (11.13%) . In another study in Tajikistan, Sharopov and Setzer the main composition of essential oil were the monoterpenic ester linalyl acetate and alcohol linalool . The result of all above studies are different from our result, based on GC/MS result 1,6-Cyclodecadiene and β- Caryophyllene were main components, While in other researchers has never been mentioned about them. Table 4: Constituents of the essential oils from the aerial part of Salvia sclarea L.
The chemical composition of plants is known to be influenced by several external factors including harvest time, climatic and seasonal factors, as some compounds may be accumulated at a particular period to respond to environmental changes. Plant material collected at different times of the year may contain different novel compounds with other bioactivities. The effects of seasonal variations on the chemical and biological characteristics of some essential oils of the Lamiaceae family have been reported in the literature . Results of GC/MS indicated that 13 compounds were identified in the essential oil from the aerial parts of Salvia multicaulis Vahl. The major components were α-Pinene (29.82%), 1,8-Cineole (23.84%) and Camphor (19.93%) (Table 5). Table 5: Constituents of the essential oils in the aerial part of Salvia multicaulis Vahl. The result of our study is different from the other world surveys. According to Ahmadi and Mirza, bornyl-acetate and camphor have the highest percentages among the constitute of S. multicaulis Vahl, while we have detected only high amounts of camphor (19.93%) and there is no bornyl-acetate in our results . Also, Senatore et al. reported that the major components of essential oils of Salvia multicaulis Vahl growing wild in Lebanon were α-copaene (8.0%), α-pinene (6.6%), myrtenol (5.7%) and trans-sabinyl acetate (5.3%) . Feo et al. reported that the oil of Salvia multicaulis Vahl var. simplicifolia is rich of monoterpenes and sesquiterpenes, and our results are also contradictory with these results . In similar examples, Rustaiyan et al. identified high amounts of α- pinene (26.0%), 1,8-cineole+limonene (20%) and camphor (10.0%) . 1,8-cineole, camphor, α-pinene, valeranone and alpha-eudesmol were reported as the major components of Salvia multicaulis Vahl essential oil . Tepe et al. found 47 compounds in Salvia multicaulis Vahl essential oil and α-pinene and Eucalyptol are the main constituents . Comparison between our results and the results of the other reports showed differences, probably due to that plant varieties or sites, as well as the time of sampling. The variations in chemical compositions of the essential oils with respect to the season might have been due to the influence of phenological status, and environmental conditions can influence the regulation of the biosynthesis of essential oil . As you can see in Table 6, antioxidant activity, total flavonoids and phenolic compounds of Salvia multicaulis are higher than Salvia Sclarea. Table 6: Antioxidant activity and the amount of flavonoids and phenolic compounds of aerial part of Salvia sclarea L. and Salvia multicaulis Vahl. Lamiaceae family is very significant in terms of antioxidant activity [31-33]. Peng et al. antioxidant activity has important roles in foods and biological systems as preventing free radicals from damaging role . Karamian et al. showed that DPPH activity, total phenol and flavonoid contents of Salvia multicaulis Vahl are, 0.112, 3.70 and 1.12, respectively, but in our study these values are different . Other researchers like; Nickavar et al., Esmaeili et al. and Tepe et al. done studies on DPPH radical-scavenging activity of Salvia multicaulis Vahl but their results are different [35-37]. The reasons for these differences may be due to differences in soil and climatic. Phenolic compounds act as a free radical terminator and they are antioxidative agents . Flavonoids have the considerable role on human health and their activities are as an antioxidant . The Result showed that S. multicaulis Vahl has a higher content of total phenol and flavonoid contents. Asadi represented 85.10 (mg GAE g 01 DW) and 46.21 (mg CUE g 01 DW) for total phenols and total flavonoid in Salvia multicaulis Vahl. Karamian et al. results showed that total phenol and flavonoids compounds are 3.70 ± 0.25 (mg/g dw) and 1.12 ± 0.12 (mg/g dw), respectively . Kharazian et al. compared the amount of total flavonoids in seven wild growing salvias and concluded that between these salvias, S. multicaulis Vahl has the most amounts of flavonoids . The results of this method are in Table 7 that including Eigen values and variance Percentage for each of the components (axes). As you can see, three components are substantial include component one 45.81%, component two 30.36% and component three 23.82%. Table 7: The results of PCA analysis to determine the most substantial environmental factors. Table 8 shows ordination habitats based on the first and second components. In first component (first axis) pH, CaCO3 and elevation decrease, and organic matter increase from left to right. In second component (second axis) Silt, Ca and Aspect decrease but Sand increase from down to up. Table 8: Specific vector values of each component. The main components of the first and second graph (Figure 5) show distribution of species in relation to environmental factors by PCA analysis. 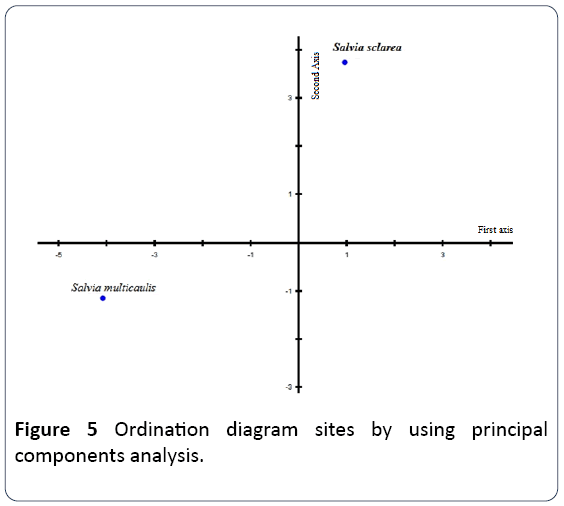 Figure 5: Ordination diagram sites by using principal components analysis. The irst and second components are the main components and these components constitute 76.179 Percentages of changes in vegetation. The irst component is more substantial, it is including 45.811% of changes and the second component has 30.368 percentages of changes. Table 8 shown Vector eigen values for each variable in each of the components. According to coefficients, the irst component is including elevation, pH, CaCO3 and soil organic matter. Clay, silt, Ca and aspect are the most substantial factors in the second component. Salvia multicaulis Vahl is in the third quarter of coordinate axis and due to the great distance compared to the second axis is more affected by the properties of the first axis and show a trend toward higher acidity, CaCO3 and elevation (Table 8, Figure 5). As you can see, Salvia Sclarea L. is in the first quarter of coordinate axis and due to the great distance compared to the first axis is more affected by the properties of the second axis and show a trend toward higher Sand (Table 8, Figure 5). Based on the results of soil properties (pH, CaCO3 and organic matter) are involved in the breakdown of plant distribution and this result has been approved by Sun et al. . Brauch study results proved that the amount of sand and elevation are influencing factors to determine Venezuela Savanna. Among the investigated cations; just calcium has a role in distribution . Zare Chahuki et al. Shown that soil texture is one of the main factors in controlling the vegetation distribution . Soil texture effect on vegetation distribution is due to its effect on soil moisture because differences in the amount of moisture cause to changes in forming, soil structure filtration and the amount of its salinity . Soil texture is mention in many studies as a factor that affecting the distribution of plant species [43-46]. Soil pH depends on soil organic matter, as you can see soil organic matter is S. sclarea habitat is higher than that of in S. multicaulis habitat and pH is on the contrary. According to David et al. more root biomass and more active microorganism metabolism in the rhizosphere can lead to the reduction in pH mean value of soil . Hinsinger et al. noted that the secretion of organic acids from the roots and amounts of CO2 released from roots and micro-organisms could lead to the decrease in pH . Topography along with climate and soil factors is another important factor that affects the vegetation distribution, altitude pattern can control the properties of climate (precipitation, temperature, evapotranspiration) and soil. Aspect is another environmental factor that influencing the vegetation distribution. Geographical factors like different aspect have effects on the amount of water available for plant, the temperature of soil and the amount of light absorbed by plant, so determine the ecological field of any species. Therefore, they can act as a limiting factor for plant propagation . The results of the study reveal that, ecological requirements of each species are different and these ecological factors have the important effect on plants. Salvia multicaulis Vahl shows a trend toward higher acidity, CaCO3 and elevation but Salvia Sclarea L. shows a trend toward higher Sand. Associated species of Salvia Sclarea L. and Salvia multicaulis Vahl are different. The results showed that the number and type of Salvia Sclarea L. and Salvia multicaulis Vahl components were different. This survey shows the occurrence of α-Pinene (29.82) of Salvia multicaulis Vahl and 1,6-Cyclodecadiene (41.95) of Salvia Sclarea L. in Hezarjarib summer rangeland in the north of Iran. Differences between our study results and the results of other surveys could be attributed to the different environmental situation and climatic conditions, sampling times, geographic origins, soil characteristics, Plant life period, and extraction methods. Szentmihályi K, Then M (2002) Comparative study on tannins, flavonoids, terpenes and mineral elements of some Salvia species. In XXVI International Horticultural Congress: The Future for Medicinal and Aromatic Plants 629: 463-470. Yousefzadi M, Sonboli A, Karimi F, Ebrahimi SN, Asghari B, et al. (2007) Antimicrobial activity of some Salvia species essential oils from Iran. Zeitschrift für Naturforschung C 62: 514-518. Farka P, Hollá M, Tekel J, Mellen S, Vaverková T (2005) Composition of the essential oils from the flowers and leaves of Salvia sclarea L.(Lamiaceae) cultivated in Slovak Republic. Journal of Essential Oil Research 17: 141-144. Â, KüfrevioÃÂlu ÖÃÂ° (2004) Evaluation of the antioxidant and antimicrobial activities of clary sage (Salvia sclarea L.). Turkish Journal of Agriculture and Forestry 28: 25-33. Vogiatzakis IN, Kazakis G, Ghosn D (2009) Macrophyte community structure and species occurrence in relation to environmental determinants in the ephemeral aquatic habitats of Gavdos, Greece. Hydrobiologia 630: 127-138. Song A, Liu S, Shi Z, Dong L (2006) Quantitative classification and ordination of subalpine meadow in wolong Nature Reserve. Ying Yong Sheng Tai Xue Bao The Journal of Applied Ecology 17: 1174-1178. Yibing Q, Zhaoning W, Liyun Z, Qingdong S, Jin J, et al. (2004) Impact of habitat heterogeneity on plant community pattern in Gurbantunggut Desert. Journal of Geographical Sciences 14: 447-455. Mills A, Fey M, Donaldson J, Todd S, Theron L (2009) Soil infiltrability as a driver of plant cover and species richness in the semi-arid Karoo, South Africa. Plant and Soil 320: 321-332. Zhang ZH, Hu G, Ni J (2013) Effects of topographical and edaphic factors on the distribution of plant communities in two subtropical karst forests, southwestern China. Journal of Mountain Science 10: 95-104. Pourmorad F, Hosseinimehr SJ, Shahabimajd N (2006) Antioxidant activity, phenol and flavonoid contents of some selected Iranian medicinal plants. African Journal of Biotechnology 5: 1142-1145. Karamian R, Asadbegy M, Pakzad R (2013) Essential oil compositions and in vitro antioxidant and antibacterial activities of the methanol extracts of two Salvia species (Lamiaceae) from Iran. International Journal of Agriculture and Crop Sciences 5: 1171. Kofidis G, Bosabalidis A, Kokkini S (2004) Seasonal variation of essential oils in a linalool-rich chemotype of Mentha spicata grown wild in Greece. 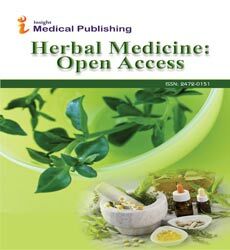 Journal of Essential Oil Research 16: 469-472. Bouyoucos GJ (1962) Hydrometer Method Improved for Making Particle Size Analyses of Soils. Agronomy Journal 54: 464-465. Sun J, Li XZ, Wang XW, Lv JJ, Li ZM, et al. (2009) Latitudinal changes in species diversity of permafrost wetland plant communities in Great Xing’an Mountain valleys of Northeast China. Acta Ecologica Sinica 29: 272-277. Jafari HM (2003) Methods of soil analyze- physical and chemical sampling and analysis, Published by Nedaye Zoha, p: 236. Famiglietti JS, Rudnicki JW, Rodell M (1998) Variability in surface moisture content along a hillslope transect: Rattlesnake Hill, Texas. Journal of Hydrology 210: 259-281. Shaidai KE (2011) Carbon sequestration potential redox species of Agropyron elongatum and Atriplex lentiformis (Case Study: Chaparqoymeh the Gonbad). Gorgan University of Agricultural Sciences and Natural Resources, p: 85. SokoviÃÂ M (2001) Antifungalna aktivnost etarskih ulja odabranih aromatiÃÂnih i lekovitih biljaka in vitro i in vivo. Doctoral Dissertation, University of Belgrade. Pitarokili D, Couladis M, Petsikos-Panayotarou N, Tzakou O (2002) Composition and antifungal activity on soil-borne pathogens of the essential oil of Salvia sclarea from Greece. Journal of Agricultural and Food Chemistry 50: 6688-6691. Fraternale D, Giamperi L, Bucchini A, Ricci D, Epifano F, et al. (2005) Composition and antifungal activity of essential oil of Salvia sclarea from Italy. Chemistry of Natural Compounds 41: 604-606. Â¾amiÃÂ A, SokoviÃÂ M, RistiÃÂ M, GrujiÃÂ-JovanoviÃÂ S, VukojeviÃÂ J, et al. (2008) Chemical composition and antifungal activity of Salvia sclarea (Lamiaceae) essential oil. Archives of Biological Sciences 60: 233-237. Ghani A, Ebrahimpour A, Tehrani-far A, Hassanzadeh-Khayyat M (2010) Evaluation of growth and development adaptability and medicinal ornamental potential of Clary sage (Salvia sclarea L.) cultivated in Mashhad climatic conditions. J of Plant Production 17: 77-90. Sharopov FS, Setzer WN (2012) The essential oil of Salvia sclarea L. from Tajikistan. Records of Natural Products 6: 75. Ahmadi L, Mirza M (1999) Essential oil of Salvia multicaulis Vahl from Iran. Journal of Essential Oil Research 11: 289-290. Senatore F, Arnold NA, Piozzi F (2004) Chemical composition of the essential oil of Salvia multicaulis Vahl. var. simplicifolia Boiss. growing wild in Lebanon. Journal of Chromatography A 1052: 237-240. De Martino L, Roscigno G, Mancini E, De Falco E, De FV (2010) Chemical composition and antigerminative activity of the essential oils from five Salvia species. Molecules 15: 735-746. Rustaiyan A, Masoudi S, Monfared A, Komeilizadeh H (1999) Volatile constituents of three Salvia species grown wild in Iran. Flavour and Fragrance Journal 14: 276-278. Bagci E, Kocak A (2008) Essential oil composition of the aerial parts of two Salvia L. (S. multicaulis Vahl. Enum and S. tricochlada Bentham) species from East Anatolian Region (Turkey). Int J Sci & Tech 3: 13-18. Tepe B, Donmez E, Unlu M, Candan F, Daferera D, et al. (2004) Antimicrobial and antioxidative activities of the essential oils and methanol extracts of Salvia cryptantha (Montbret et Aucher ex Benth.) and Salvia multicaulis (Vahl). Food Chemistry 84: 519-525. Masotti V, Juteau F, Bessière JM, Viano J (2003) Seasonal and phenological variations of the essential oil from the narrow endemic species Artemisia molinieri and its biological activities. Journal of Agricultural and Food Chemistry 51: 7115-7121. Lamaison JL, Petitjeanfreytet C, Carnat A (1996) Medicinal Lamiaceae with antioxidant activity, potential sources of rosmarinic acid. Pharmacology Acta Helvetiae 66: 185-188. Zheng W, Wang SY (2001) Antioxidant activity and phenolic compounds in selected herbs. Journal of Agricultural and Food Chemistry 49: 5165-5170. Shan B, Cai YZ, Sun M, Corke H (2005) Antioxidant capacity of 26 spice extracts and characterization of their phenolic constituents. Journal of Agricultural and Food Chemistry 53: 7749-7759. Peng Y, Ye J, Kong J (2005) Determination of phenolic compounds in Perilla frutescens L. by capillary electrophoresis with electrochemical detection. Journal of Agricultural and Food Chemistry 53: 8141-8147. Nickavar B, Kamalinejad M, Izadpanah H (2007) In vitro free radical scavenging activity of five Salvia species. Pak J Pharm Sci 20: 291-294. Esmaeili A, Rustaiyan A, Nadimi M, Larijani K, Nadjafi F, et al. (2008) Chemical composition and antibacterial activity of essential oils from leaves, stems and flowers of Salvia reuterana Boiss. grown in Iran. Natural Product Research 22: 516-520. Tepe B, Sokmen M, Akpulat HA, Sokmen A (2006) Screening of the antioxidant potentials of six Salvia species from Turkey. Food Chemistry 95: 200-204. Shahidi F, Janitha PK, Wanasundara PD (1992) Phenolic antioxidants. Critical Reviews in Food Science & Nutrition 32: 67-103. Kharazian N (2013) Identification of flavonoids in leaves of seven wild growing Salvia L.(Lamiaceae) species from Iran. Progress in Biological Sciences 3: 81-98. Baruch Z (2005) Vegetation–environment relationships and classification of the seasonal savannas in Venezuela. Flora-Morphology, Distribution, Functional Ecology of Plants 200: 49-64. Zare Chahoki MA, Jafari M, Azarnivand H (2007) Relationships between species diversity and environmental factors of Poshtkouh rangelands in Yazd. Pajouhesh & Sazandegi 21: 192-199. El-Ghani MMA, Amer WM (2003) Soil–vegetation relationships in a coastal desert plain of southern Sinai, Egypt. Journal of Arid Environments 55: 607-628. Husseini TM (2001) The investigation of some important species by soil characteristics in Taleghan 10. Noy-Meir I (1974) Multivariate analysis of the semiarid vegetation in south-eastern Australia. II. Vegetation catenae and environmental gradients. Australian Journal of Botany 22: 115-140. Iravani M (2000) The investigation of in three habitat species by the ordination methods. Esfahan University, pp: 98. Jafari M, Bagheri H, Ghanad M, Arzani H (2004) Investigating the Relationship between Physical and Chemical Properties of Soil and Dominant Species of the Mehr Region of Qom Province. Natural Resources Journal 1: 25-36. Jones DL, Hodge A, Kuzyakov Y (2004) Plant and mycorrhizal regulation of rhizodeposition. New Phytologist 163: 459-480. Hinsinger P, Plassard C, Tang C, Jaillard B (2003) Origins of root-mediated pH changes in the rhizosphere and their responses to environmental constraints: a review. Plant and Soil 248: 43-59. Moghadam M (2004) Range and range management. Tehran University Publishes.